Wenger is presiding over barely controlled chaos. The Emirates boardroom is divided among several rival factions, none of which are interested in spending money. Jack Wilshere is Arsenal’s best player apart from van Persie, but he’s been injured for more than a year. New signing Lukas Podolski looked tired and exasperated at the European Championships. And Marouane Chamakh somehow still plays for the club. Wenger has spent frugally throughout his mostly successful managerial career. But this summer, for the first time ever, his unwillingness to splash the cash could jeopardize Arsenal’s participation in the Champions League. Asked if he was interested in French international midfielder Yann M’Vila, the type of all-action, box-to-box player Arsenal desperately need, Wenger replied, “No. We wait on Diaby and Wilshere,” two players he has routinely referred to as “new signings.” His loyalty and patience are admirable. His logic is not. Neither Diaby nor Wilshere started a single Premier League game in 2012. Last season, Arsenal limped into the Champions League on the back of van Persie goals, a luxury they won’t have in 2012/13. They are in dire need of reinforcements. Arsenal fans are used to this kind of thing. The 2011/12 Premier League campaign began badly as the club allowed rumors and newspaper speculation to drag on until the start of the new season, instead of settling matters quickly. That summer, Wenger stubbornly resisted transfer activity until the final day of the window and then signed four players in 12 hours. Of those scattergun buys, only Mikel Arteta, a player Arsenal should have signed several years earlier, went on to enjoy a successful season. The others – Yossi Benayoun, Per Mertesacker and Andre Santos – were horribly misjudged acquisitions. The randomness of that late scramble was precisely the kind of dysfunction Wenger was hoping to avoid this summer, but his handling of the van Persie saga – Wenger’s public statements have alternated between resigned sadness at RvP’s impending exit and bullish resolve to keep him – suggests that he hasn’t learned from his mistakes. 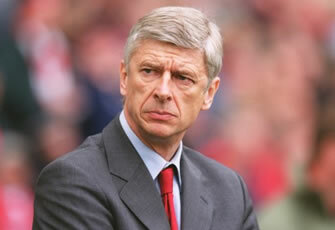 Arsene Wenger has chalked up many impressive achievements during his 15 years as Arsenal manager. Arriving from the relative obscurity of the J-League, he managed not only to secure silverware, but also to inculcate a dynamic, attacking style. He is indisputably a Premier League legend. But over the last five seasons, his performance has declined considerably. In the mid-2000s, he talked about building a team around specific players, all of whom have since deserted him. His behavior on the sidelines has become increasingly erratic. No water bottle is ever safe. Arsenal’s trophy drought is well-documented, and it will continue if the club can’t improve on their halfhearted attempts to build on each season’s scraps of potential. No one is asking Arsenal to compete in Manchester City’s transfer stratosphere – indeed, it’s refreshing to see Wenger reject the financial doping now commonplace in the European game – but by failing to provide adequate assurance to their top players, either by signing other European stars or by devising a convincing long-term plan, the club neglect their most important sporting duty: to compete. Wenger insists on running Arsenal like a business, but that philosophy, while admirable, isn’t productive – at least, not at the extreme he has taken it to. It’s quite possible that clubs’ meticulous attempts to find loopholes in the new Financial Fair Play policies will derail UEFA’s plans for a financially healthy European footballing community. That would represent a major blow to Wenger’s vision of a competitive but profitable Arsenal. Arsenal’s league campaign starts at home to Sunderland on August 18. On paper, that fixture seems an easy way to kick off the new season. If the current mess continues, however, opening day will be anything but straightforward. Great read – I definitely agree that Arsenal is shaky right about now. At the same time, Liverpool seems to be excelling. I think this is a result of the confusion during the olympics in which the South Korean flag was displayed instead of the North Korean flag. I would advise INFTH to analyze British football in the scope of the entire world, even outside of Europe. That is very insightful. I completely agree with you – at least about the Liverpool part. I am not very sure that Korean football affected this matter at all.